Science is by definition in a state of constant revision: and organismal systematics—the subset of which I am fondest, and therefore upon which this blog concentrates—is no exception. Therefore, despite the fact that Life, et al. will see what is merely its third birthday this month, some of what I have written here has already been superseded by new discoveries: and since I am too lazy to revise my original posts where necessary, I have resolved to provide the needful updates here. Doubtlessly the majority of my posts have been rendered obsolete in some manner since their publication, and thus it would be a task both Sisyphean and unnecessary to keep a finger on them all: instead, I intend here to simply make note of the recent news of which I have become aware. A new genus (and two species) of mantidfly (Mantispidae) has been described: Allomantispa tibetana and mirimaculata (Liu et al., 2014), restricted to the southeastern fringe of the Tibetan Plateau. Notably, Allomantispa is assignable to the Drepanicinae, a subfamily heretofore known to have a relictual distribution in South America and Australia (there are fossil drepanicines known from Eurasia; Makarkin, 1990; Liu et al., 2014). This constitutes a significant addition to the limited information I gave on the taxon in "Mantidflies: Chimeras of the Insect World". The reclusive armadillo ants (of which I provided an overview in May 2014)—formerly the sole living members of the Agroecomyrmecinae—now have an extant confamiliar, in the form of the enigmatic Ankylomyrma coronacantha. Formerly shuffled about in the Myrmicinae, the monotypic Ankylomyrmini was found to be sister to Tatuidris tatusia in an extensive phylogenetic re-analysis of that immensely speciose subfamily (Ward et al., 2015). A. coronacantha is nonetheless dissimilar to its cousins in both biogeography (Afrotropical, as opposed to the Neotropical and Holarctic distribution of Agroecomyrmecini living and extinct) and morphoecology (ankylomyrmines are large and arboreal, unlike the diminutive soil-dweller T. tatusia) (Bolton, 1973). Despite what I stated as regards the fossil taxon Umenocoleoidea in "The Origin of Earwigs", the type genus Umenocoleus has been reclassified as a beetle (Kirejtshuk et al., 2013). Its supposed relatives remain, however, an odd lineage of "roachoids" unrelated to Umenocoleus (Nel et al., 2014) or to the Protelytoptera, an order in which this exceedingly confusing Cretaceous genus has also been placed (Carpenter, 1992). May you suffer through the holidays with somewhat less than the accustomed amount of pain. Bolton, B. (1973). 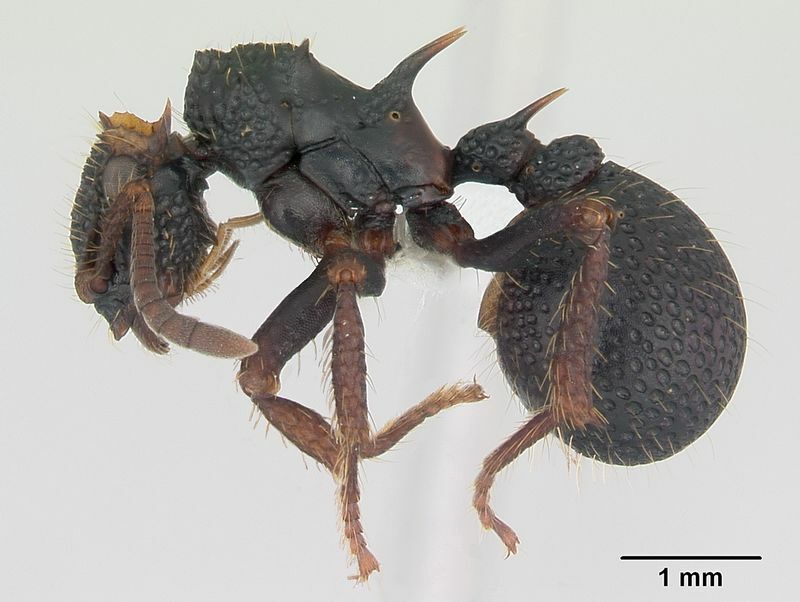 A remarkable new arboreal ant genus (Hym., Formicidae) from West Africa. Entomologist's Monthly Magazine, 108, 234-237. Carpenter, F. M. (1992). Treatise on Invertebrate Paleontology (vol. 3, pt. R). Boulder: Geological Society of America. Kirejtshuk, A. G.; Poschmann, M.; Prokop, J.; Garrouiste, R.; and Nel, A. (2013). Evolution of the elytral venation and structural adaptations in the oldest Paleozoic beetles (Insecta: Coleoptera: Tshekardocoleidae). Journal of Systematic Paleontology, 12, 575-600.